Music: Chandler Carter, Martha Sullivan, Robinson McClellan, Jonathan David, Lauren Bernofsky, Scott Gendel, Eleonor Sandresky, Jason Robert Taylor, Susan Botti. Narkissos, (Greek: Νάρκισσος, or Narcissus), is a unique theatre piece that combines original art song, unorthodox staging and audio-visual media to explore the multi-layered themes of narcissism, self-entitlement, and the individuals’ struggle for identity and success in today’s culture. 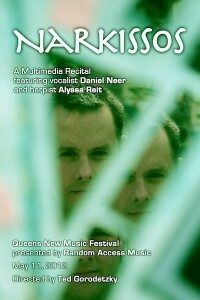 Conceived by writer and performing artist Daniel Neer, this staged recital for voice and harp investigates the mythological figures of Narcissus, Echo, and Nemesis with insightful and nuanced contemporary interpretations of these fabled archetypes. Through original art song, narration, unorthodox staging and audio-visual multimedia, Narkissos explores the multi-layered facets of narcissism with specific focus on self-entitlement, fear, and the individuals struggle for identity and success in today’s culture. Joined by harpist Alyssa Reit, and with direction and multimedia composition by Ted Gorodetzky, Narkissos modernizes the traditionally classical structure of the Art Song Recital, and features eleven songs for male voice and harp, including world premieres by composers Chandler Carter, Martha Sullivan, Jonathan David [Gitchee Gumee], Alyssa Reit, Lauren Bernofsky, and Scott Gendel [Metamorphosis], with additional music by Robinson McClellan [The Gyre], Eleonor Sandresky, Susan Botti, Jason Robert Taylor and Benjamin Britten.